A scholar of Trinity College, Cambridge, who became canon of Canterbury in 1859, James Craigie Robertson (1813&#x2013;82) edited for the Rolls Series this seven-volume work, published between 1875 and 1885. Superseding the earlier work of J. 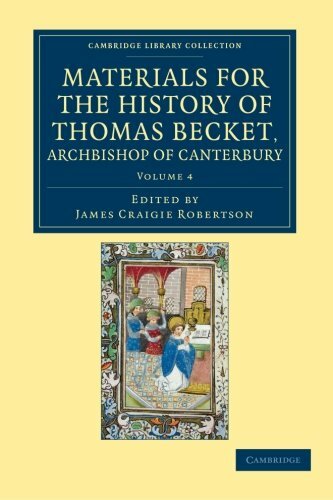 A. Giles, it is a collection of contemporary Latin lives and letters relating to the life of Thomas Becket (c.1120&#x2013;70). Rising through the ranks to become royal chancellor and then archbishop of Canterbury, Becket fell dramatically out of favour with Henry II and, on his return from exile, was famously murdered in the cathedral church at Canterbury. Following his canonisation in 1173, his reputation grew considerably throughout western Christendom. Volume 4 contains two contemporary anonymous lives, one of which is tentatively ascribed to Roger of Pontigny. Also included is the Quadrilogus, a composite narrative comprising the writings of four biographers, including Elias of Evesham. This seven-volume work, published 1875&#x2013;85, brings together all Latin materials concerning the life and fall of Thomas Becket (c.1120&#x2013;70). Volume 4 contains two contemporary anonymous lives, one of which is tentatively ascribed to Roger of Pontigny, and the Quadrilogus, drawn from the narratives of four biographers.